Wan't to know which type and grade of pencil is best suited to you writing needs ? Would you like to know the difference between a colored pencil, and a standard pencil ? Wan't to know which type of pencil is best suited to you writing needs ? This guide will help answer your questions by explaining how different types of pencil are constructed, how they are used, the materials they are made from, and how darkeness and hardness of these materials are measured. The most commonly used pencil is made from a writing material or "lead" which is glued between two slats of wood. The sandwich is heat and pressure treated to ensure it stays together, cut to length, shaped, and often painted to create the pencil which is desired. Pencils are most often formed into a round or hexagonal shape but are regularly formed into other shapes depending on their purpose e.g. carpenters pencils are often rectangular or oval shaped so they won't roll off a work bench. Pencil "leads" as we know them have never been manufactured from the element Lead. The term "lead" is a misnomer which originated in the early 1500s when a large deposit of graphite was discovered in England and used to make pencils, scientists incorrectly identified the graphite as a form of the element lead and the name has stuck to this day. Having said this Lead was a commonly used ingredient in paint prior to the 1970s so while the writing material in pencils may be safe it is entirely possible that the paint used to coat pencils manufactured prior to the 70s is quite toxic. The origins of the modern day pencil can be traced back to 1795 when Nicholas Jacques-Conte developed a process where graphite , clay , and water were mixed together and fired in a kiln to produce "leads" of varying grades which are strong and glide smoothly across paper. Pencil "leads" leave markings that range between gray and black are created by combining graphite which is a naturally occurring form of Carbon with water and clay . The proportions of Graphite and clay are varied to create leads of different darkness and hardnes. A higher proportion of clay results in a harder lighter colored lead whereas a higher proportion of graphite makes for a softer darker lead. Leads are fired at the end of the manufacturing process to make them stronger and are then finally infused with liquid wax to provide lubrication. The result is a strong lead of the desired tone and hardness which glides over the page easily when writing and does not break easily. The darkness and hardness of a graphite lead is commonly measured using the HB Scale with H standing for hardness and B standing for blackness. The higher the number in front the harder or blacker the lead is e.g. a 8B lead is very black and very soft where a 6H is much harder and lighter. HB sits pretty much in the centre of the scale and is considered ideal for writing, while harder leads are typically better for technical drawing and , softer leads are considered better for artwork. The table below describes the HB scale of lead grades and their typical uses. 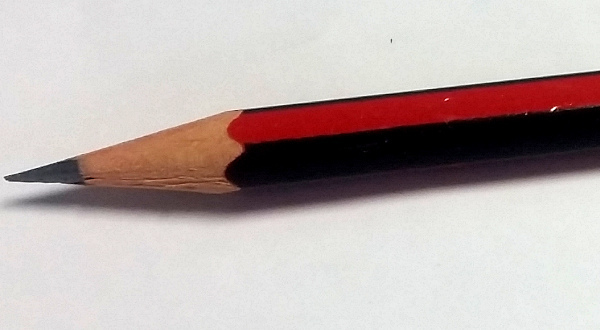 The next most common pencil type is colored pencils which come in many types suited to school children , artists, architects, and pretty much anyone who has a desire to use them. A recent trend in adult coloring books has seen a resurgence in the use of colored pencils by adults. 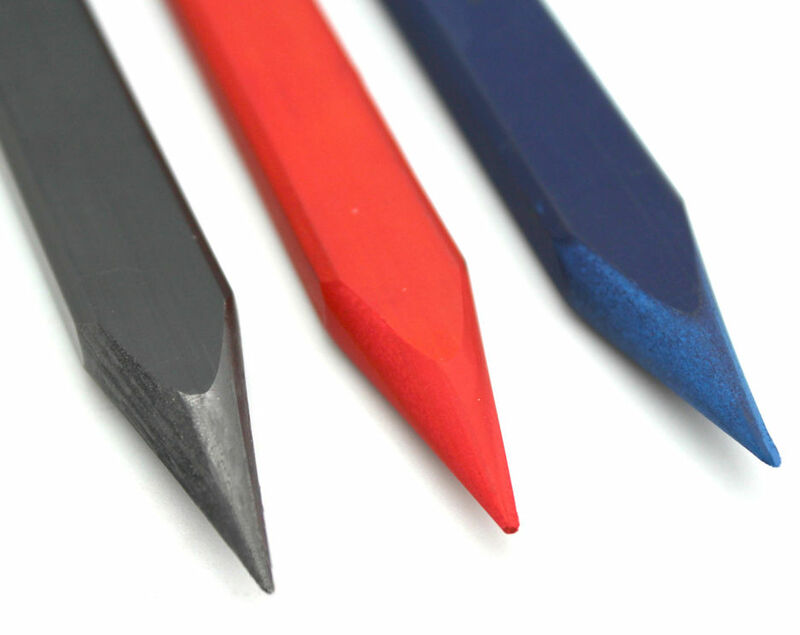 The leads in Colored pencils are manufactured in a very similar manner to standard graphite leads but rather than being made of graphite and clay they are manufactured using special pigments, minerals, and binding agents. Binding agents in colored pencils vary from manufacturer to manufacture but typically comprise of non water-soluble gums or resins. Another pencil innovation is water color pencils which allow an artist to create a drawing on paper which can then have water applied to it resulting in a water color effect. Leads used in water color pencils are manufactured using a similar process to other colored pencils but use water soluble binding agents such as water soluble gum so that the pigment applied to paper can disperse with the simple addition of water. Woodless pencils are as the name imples a pencil which is made of solid core material with no wood encasing it, these pencils are tree friendly and result in very little waste as the entire pencil can be used. Woodless pencils are manufactured with the same basic core materials as standard pencils e.g. graphite , carbon , colored and are manufactured in the same shapes e.g. round , hexagonal , oval , and rectangular. In most cases a woodless pencil will be coated in a thin laquer to prevent the core material smudging onto the writers hand. Because of the large surface area combined with a sharp point woodless pencils are commonly used by artists for drawing and shading and if used regularly for a combination of shading and point work will rarely require sharpening. Woodless pencils can be sharpened with a regular pencil sharpener just like any other pencil but if you find yourself doing this you should consider getting a standard wooden pencil to do your fine point work with. Mechanical pencils were around before wooden pencils were invented and have a number of advantages over standard wooden pencils. The primary advantages are that they can be refilled with the lead grade of your choice and do not require sharpening which means that your pencil retains the same size and shape until you lose it or it wears out after , hopefully, many years of use. This is a real advantage if you wan't to use your pen for writing with a HB lead one day and technical drawing with a 2H lead the next. There are several types of mechanical pencil but all have the same basic purpose which is to allow a pencil lead to be advanced through the point of the pencil and then be held in place so that it can be used to write with. The most common type of mechanical pencils are the click pencil which requires the writer to click on the end of the pencil to advance the lead , other less common types are the twist pencil which allows the writer to advance the lead by twisting the end of the pencil, and automatic pencils which use the intermittent pressure applied by the writer while they are writing to advance the lead as required. Mechanical pencils commonly come with bult in erasers on the non writing end and some times build in lead pointers in the case of mechanical pencils with thick leads. Some mechanical pencils come with textured grip zones or even ergonomic gel grips to make writing more comfortable. The disassembled parts of the same pencil are shown below. 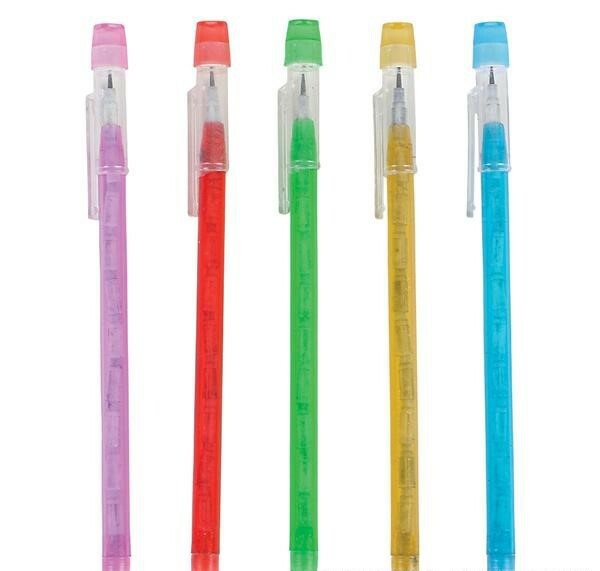 Pop a point pencils are a pencil which is made from a plastic tube which is filled with a number of leads embedded in small plastic plugs that can slide inside the larger tube in a manner that resembles a dart inside a blow tube. These pencils are an economical pencil that does not require sharpening as a point is simply used until it is blunt and then removed and "popped" into the back of the tube to push the next sharp lead forward.